Anti-TNF Biosimilars In Europe: What Matters Beyond Price? The recent introduction in Europe of biosimilar anti-tumor necrosis factor (anti-TNF) drugs has attracted considerable attention. Much of the commentary to date has centered on price, but price tells only part of the story. Structural and perceptual differences have led to considerable heterogeneity in the levels of discounting, access, and uptake throughout and even within European markets. The level of discounting does not always correlate with the level of biosimilar uptake, indicating that other forces are at play. Across markets, clinicians generally agree on initiating naive patients on biosimilar anti-TNFs, but attitudes toward switching — and the interchangeability of the products — vary considerably. The need for more clinical experience and long-term data are the main barriers to switching, suggesting that deeper discounts may not necessarily drive higher uptake. European payers are employing a range of tools to push biosimilar uptake, but for the most part they are using these tools with a light touch, until clinicians become more accepting of interchangeability. It is important for all stakeholders to benefit from the cost-savings realized with biosimilar usage. For example, clinicians may be more reluctant to persuade patients to switch if there is no direct upside to doing so (such as additional funds for staffing, equipment, or treating more patients). We reached these conclusions after discussions with 54 experts representing a mix of payers and clinicians across nine European markets. These experts play an influential role in decision-making for anti-TNF biosimilars in their respective markets. From a prescription standpoint, clinicians broadly agree that they expect to initiate naive patients on the biosimilar version of a chosen anti-TNF. However, clinician attitudes vary considerably across markets when it comes to switching patients who are stable on the originator to the less-expensive biosimilar. In the case of infliximab, clinicians in Norway and Poland have now switched the majority of their stable Remicade patients to the less expensive biosimilar (Figure 1). 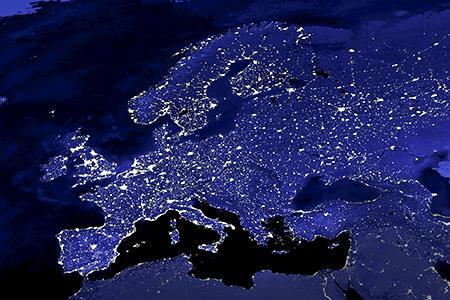 In Germany, the Netherlands, Spain, and the UK, some centers have also switched, but clinicians in France, Italy, and Portugal remain largely resistant. Most respondents reported that price was not the main barrier to switching; only 14% of respondents said it was. Rather, they cited the need for more data and experience with the biosimilar infliximab, from studies such as NOR-SWITCH, because biosimilars are not identical to the originator product in the same way as small-molecule generics. This concern highlights clinical and ethical considerations around switching a stable patient to a biosimilar purely for economic reasons. Prescribing practices for the subcutaneous biosimilar anti-TNFs (e.g., etanercept and adalimumab) are expected to follow a pattern similar to that of infliximab, although switching may occur sooner with etanercept, as its immunogenicity is lower. 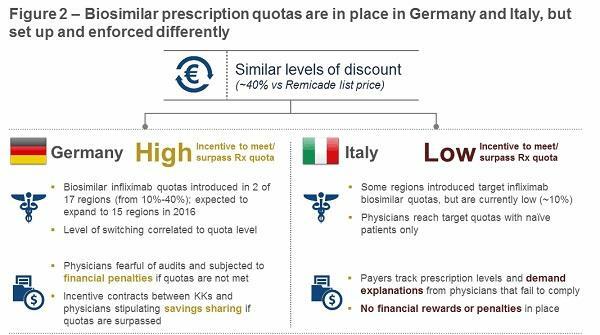 Discounting can play a pivotal role in biosimilar adoption rates by driving payers to put pressure on the decision-making chain to incentivize biosimilar uptake. From the manufacturers’ point of view, however, discounting can be a blunt instrument when used without proper payer incentives, given the existing clinician price insensitivity to switching. The implementation and effective use of market access tools that payers and manufacturers have at their disposal can be as critical as discounts to the successful adoption of biosimilars. In most markets, nonexclusive tenders are conducted where biosimilars compete only for naive patients, with payers actively guiding use in this patient population. This practice often leads to limited de facto savings. A few more-progressive organizations are currently conducting “winner-takes-all” exclusive tenders, while others are opting for alternative market access tools, such as prescribing quotas that give physicians greater power of choice on an individual patient basis. So far, however, this practice has achieved mixed results (Figure 2). National payer guidelines play a role in adoption, but these remain heavily influenced by clinical society recommendations. Overall, many stakeholders view such guidelines as being cautious and not providing definite recommendations to more actively guide their decision-making. 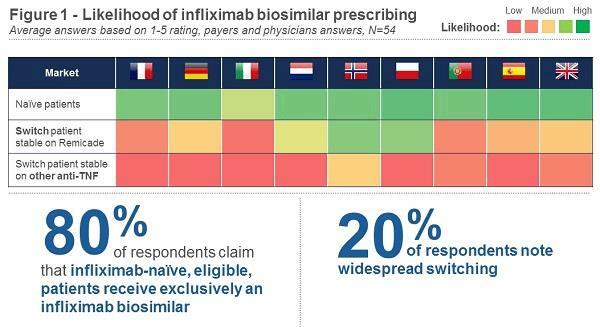 Regional and local payers tend to be more progressive in their guidance, either recommending or enforcing the use of infliximab biosimilars in naive patients. With the exception of some progressive centers, payers seldom actively recommend the switching of patients, leading to considerable intramarket variability. The vast majority of stakeholders perceive automatic pharmacy substitution, including switching, for all patients as a potentially effective tool for biosimilar adoption. However, the stakeholders we interviewed did not expect the practice to be implemented in the foreseeable future. Substitution requires national-level consensus on the interchangeability between the originator and the biosimilar irrespective of the INN — accruing this type of consensus would take years of experience with multiple biosimilar anti-TNFs. The ways in which cost savings are realized for different stakeholders can sometimes be underestimated, but the discussion is central to consideration of biosimilar adoption. Clinicians and local payers may recognize the need to generate savings for their healthcare systems, but unless some of those savings can be retained for their organizations, there is little incentive to change existing practices. Overall, biosimilar manufacturers should avoid over-discounting with late adopters, and instead use evidence from early adopters to communicate best practices. Similarly, originator manufacturers should avoid reactionary discounting in conservative, slow-to-switch markets, and instead look for opportunities to partly offset discounts with increased volumes. Finally, payers should readjust their expectations on discount levels from manufacturers if they are not committed to implementing effective market access mechanisms to drive biosimilar uptake. Alex Grosvenor is a senior principal at Precision for Value and the European lead for the company’s Global Pricing & Market Access practice. He is a recognized authority on biosimilars, having presented at industry conferences on this topic and advised biosimilar manufacturers on their launch pricing and market access strategies. Andre Vidal Pinheiro, Ph.D., is a senior engagement manager at Precision for Value’s Global Pricing & Market Access practice. With multiple studies published in international conferences and peer-reviewed journals, Andre is a recognized thought-leader in the biosimilars space. For the past five years, he has been helping biosimilar and branded products manufacturers navigate through the P&MA challenges and opportunities in Europe and Latin America. Mansi Vithlani, Ph.D., is an engagement manager at Precision for Value’s Global Pricing & Market Access practice. She has significant experience in the biosimilar space, having supported a number of clients in their biosimilar launch and defense strategies across Europe. Kyle Sarnataro is a consultant at Precision for Value in the company’s Global Pricing & Market Access practice. His work has spanned projects encompassing early pricing valuation, launch pricing policy, and multi-indication strategy, with an enhanced focus on oncology and biosimilars, in markets such as the U.S., EU, Latin America, and Japan.